There is no sweet spot upon our delicate balances, just cheap footing and heights that will make your eyes water. The wires are everywhere, strung over the infield of a racetrack, taut across our backyards, between skyscrapers and canyons, between people, or just positioned for us to get from one morning to that coming evening light, unhit, not discombobulated. It could be that a tiny word at a meal, or the faintest of looks over wine will topple us from down below, sending us reeling, arms whipping wildly through an air that's dead set on ripping us right through the safety net, to splatter for fate's janitor to clean out of the lawn or carpet. Cold wars come in a few sizes, but the warm wars -- the ones that burn and give off a fair amount of long stares and result in exasperation and quivering faces - are the ones that Christopher Porterfield of Field Report worries about on the Milwaukee, Wisconsin band's third album, "Summertime Songs." They're suntanned and wind-swept. They've been crying and they've been drinking. These warm wars are the result of chaffing, of friction and boredom. They're caused by everything and nothing at all, just guts deciding to act on a foggy and cowardly, oftentimes mistaken heart's behalf. Some people give up and some people are given up on. This is an album comprised of songs that are exactly what you think they might be if you'd assumed they would consist of all the nuance and cold shouldering, all of the behind closed doors dramatics and silences and all of the clusterfuckery that two people who used to love each other so madly all too often get to producing. There are no swimming pools and there's no lemonade. There's not even any sunblock, just the rawest of burns. There are no country club couples or tee times to deal with, but rather the kinds of nobodies we ourselves are and are surrounded by and we have to figure out how the work's gonna get done, how we're going to keep our clothes on, how we're going to get someone to want to randomly take our clothes off or what can be said to put all of the pieces back together so that some form of happiness can return home. 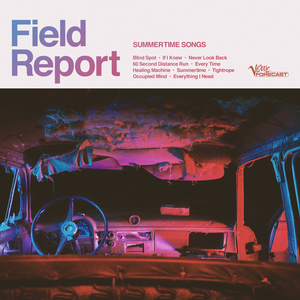 The difference between "Summertime Songs" - recorded at Wire & Vice, in the same Milwaukee neighborhood where 3/4ths of the band resides - and 2014's brilliantly autumnal feeling "Marigolden" and 2012's more chilly and intense self-titled record is that we hear Porterfield at his most honed and pure. He's more direct and effective with his writing, and in doing so, the scene is even more expertly set. It's sharper and more captivating. The character sketches that he creates with these mostly toasty and soaring hooks gluing them together are robust and stark like a Hemingway line, but with that keen eye for all of the subtle details that always made up the sad couples in Raymond Carver's stories. Every song for this album was written before the 2016 presidential election, all while Porterfield was anxious about the arrival of he and his wife's first child, but it's easy to multi-purpose some of those anxious moments for the white-knuckler that the country's been experiencing for over a year now. He plies us with songs about marital strife and letting that someone slip away (or watching them voluntarily pack up everything they have and get the hell out), but they're also vehicles for a dialogue about the fragility of America and many of the ideals that it has supposedly stood or fought for for so long. There's a lot of that fragility to sort through these days as many of us grapple with which version of panicky cold sweat we're dealing with each day. But where these stories take us is quite personal and not at all a conversation about all that we can't control. These stories remind us of all that we do or did control that WE let slip away. It's our fault usually, and we KNOW it. Porterfield shares with us many episodes involving his problematic former days as a heavy drinker and we see those boozing buddies here, up to those old, head-banging, creme de menthe breath-reeking, tree-plowing tricks. There are the copouts and the scapegoats and the promises for change. Elsewhere, there are lovers and best friends who have been brought to places in their relationships through recklessness and abandon, blindly and selfishly finding that other body that they thought they wanted or needed more, but both parties knew all about that bag that one had packed, waiting in the closet. There's one foot in and one foot out so often that it seems like normality. In all circumstances here, there's a body calling for that other body not to leave, just not to leave it. 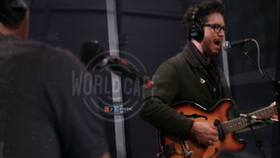 FIELD REPORT, the Wisconsin-based quartet founded and fronted by Chris Porterfield, recently performed at XPN's World Cafe. The setlist featured multiple tracks from the band's new album Summertime Songs(Verve Forecast), including the new single "Blind Spot". After the success of the band' stand out performance, Field Report played two sold-out hometown shows in Milwaukee on April 20th & 22nd at Back Room at Colectivo, bookending a Record Store Day performance at Exclusive Co. on 4/21. Porterfield is strongest as a lyricist, cutting down complex ad heartbreaking situations with deft and graceful writing – Consequence of Sound.